Ever experience the serendipity of discovering a tiny space in San Francisco–all covered with plants, or a bench and trees, or a small community garden? These eye-catching beauties are “spaces between places” and are part of the Street Park program. 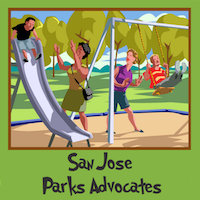 San Francisco’s Public Works Department partners with San Francisco Park Alliance to help individual stewards to create these great little places. Small pieces of public land–streets, medians, stairways, traffic circles, and bits of land are transformed and maintained by volunteer stewards.